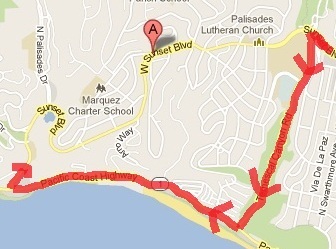 Line 2/302 will be rerouting down Temescal Canyon Rd. and PCH and only serve eastbound stops on Sunset Blvd. in this segment starting March 13. Due to circumstances beyond Metro’s control, buses can no longer use the Sunset Boulevard/Marquez Avenue turnaround. This means Metro buses will no longer be able to serve stops in the westbound direction of Sunset Boulevard between Temescal Canyon Road and Marquez Avenue beginning Wednesday, March 13. Westbound buses on Sunset Boulevard will be routed onto Temescal Canyon Road and Pacific Coast Highway before turning back onto Sunset Boulevard to an existing bus stop and layover zone. Customers wishing to access stops on Sunset Boulevard between PCH and Temescal Canyon Road will need to continue riding east from the PCH. There will be no additional charge if a bus transfer is required. Signs are being posted informing customers of the change, which will begin Wednesday morning. Metro apologizes for any inconveniences this may cause. Los Angeles = Worst city in the world. What happened to the turn around? The turnaround is no longer available for buses to use. That seems like a big impact for any bus riders who depend on service to that area. Can you elaborate on the specific cause for the turnaround being made unavailable for buses? Who / what agency is blocking Metro’s access? Thanks! Metro gets a “F” for explaining something very simple. This has nothing to do with buses not able to use the Marquez turn around (BBB #9 still using it). Currently, about 75% of 2/302 west bound bus do not go all the way to PCH – they they around at Marquez and the deadhead (i.e. run empty with “out of service sign”) back to Temscal and PCH so they can start the east bound service from PCH/Sunset. If you look at the map, there is no place for 2/302 bus to turn around at PCH/Sunset so Marquez is the the furthest west point 2/302 can go and still make a U-turn and get down to PCH/Sunset via Temescal. The 25% of 2/302 buses that currently go all the way to PCH ends their run at PCH/Sunset and turns left on PCH and deadhead empty back to the yard (e.g. they do not turn around and run 2/302 east bound). The change in route will allow Metro to simply operation so ALL 2/302 buses run the same route regardless if they will do the return east bound trips. It will cause less rider confusion and less empty deadhead running (which cuts costs). For people that depends on 2/302 west bound between Temescal and Marquez turnaround, Metro will evidently issue *free* transfers to BBB #9 per this article. There is only 1 stop west bound between Marquez turnaround and PCH (Sunset/Paseo Miramar), which if anyone actually uses it, will be served from the reverse direction when the 2/302 begin the east bound service (or a short walk from PCH/Sunset west bound terminal). I did a little research, and I found the answer (not sure why Metro is being so vague and secretive). Apparently an accident at the intersection/triangle where a motorcyclist was killed by a Big Blue Bus caused the Los Angeles Department of Transportation (DOT) to no longer allow westbound buses to use the triangle to use Marquez and turn back onto Sunset. Perhaps Metro ought to take a long look at routes 2/302. It’s the schedule that holds the record for number of notations (variences in service with 18, I think). Maybe it is time to rebuild from scratch? Why can’t Metro add more service on this portion of Line 2? Only a few trips actually do the entire route of line 2. May I suggest that, for the sentence “Customers wishing to access stops on Sunset Boulevard between PCH and Temescal Canyon Road will need to continue riding east from the PCH”, to be more precise, it should instead say ….. “Westbound customers wishing to access stops on Sunset Boulevard between PCH and Temescal Canyon Road will need stay on the westbound bus through the terminal, then ride the first available eastbound bus to Sunset Boulevard to the desired stops”. Actually Erik the 2 has 20 notes. Some of them are for school trippers, which in other agencies might be assigned a special number but which MTA groups with regular service. There was an idea floated around by the Westside sector to break up the 2 into three pieces – PCH-Westwood, Westwood-Vermont, and Vermont-Downtown – and it was posted on the Source. I think that is a very bad idea, at least until the subway to Westwood provides an all day, reliable service anchor on the west end of the route. There is nothing worse than coming off a frequent service bus which is backed up and/or bunching up and missing your infrequent bus. Basically the map above is also wrong as the turnaround loop is on the west end of Marquez. The giant clockwise loop is probably the best solution, as the Marquez/Sunset turnaround doesn’t look particularly safe from Google Maps (overgrown shrubbery). Although MTA should operate bidrectionally, 2A and 2B. Oops, that’s another note. Why are the buses not going all the way to Marquez? I am a graduate from Palisades Charter High School and remember taking the Metro 2/302 bus to school I thought there was already a signal at the Marquez turn-around. The Westbound buses should make a left on to Temescal Canyon and right on PCH then go to its terminal/ Layover at Sunset and PCH. Its an inconvenience for those who use the bus between Temescal and Marquez, safety is a priority, I think this may have happened because of a motorcycle accident at that intersection. What are the circumstances beyond Metro’s control? Where is the revised timetable? The times have not been changed. No new timetables will be issued until June. Metro, Is this a permanent change for the 2/302 to Sunset/PCH or is it a Temporary change for the turnaround? The change is effective until June 2013. Any changes made after that will be announced.